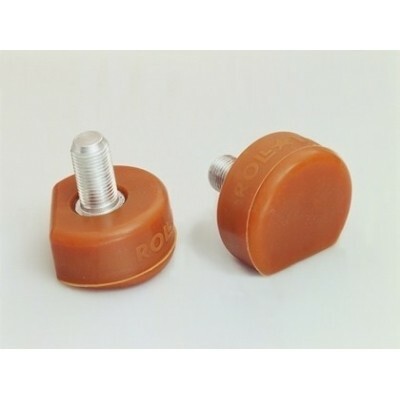 The Roll-Line toe stops are the best toe stop for those “Get Up and Run” starts and for all derby skaters. The Piccolo and Hockey toe stops are shaped with a wide foot print and flat surface for those incredibly fast starts and stops. They are 100% natural rubber and pre-cut out of the box to have a large, flat footprint that is angled for maximum contact patch once installed. The natural rubber ensures that the Ambra stops are grippy, responsive, and rebounds extremely well and has a consistent, smooth feel on any surface. These toe stops have Imperial thread, they are for standard derby plates.